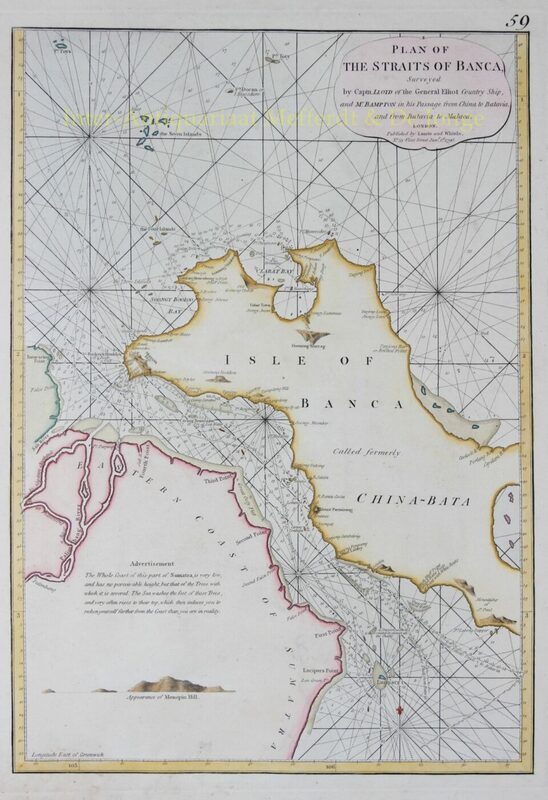 “Plan of the Straits of Banca” Copper engraving from “The East-India Pilot, or Oriental Navigator” published in London by Robert Laurie and James Whittle in 1796. Coloured by a later hand. Size: approx. 47,5 x 33,0 cm. The map offers rich detail including countless depth soundings, notes on the sea floor, commentary on reefs and shoals (e.g. “a dangerous shoal omitted in almost all the charts”), rhumb lines, place names and a wealth of other practical information for the mariner. Cartographically it was derived from surveys by Captain Joseph Huddart, John Price, and a Mr McDonald.